Berkhamsted is getting ready once again to host the biggest mass participation sports event in Dacorum – the annual Berkhamsted Half Marathon and Five Mile Fun Run. Runners around the county are starting to prepare in earnest for this challenging but very rewarding pair of races that mark the start of the spring season. In 2015, the Berko races – organised by the local Rotary Club of Berkhamsted-Bulbourne – drew a record field of 2,089 entries, from half marathon winners Paul Adams and Nadine Lewycky right through to first-timers attempting to complete the 13.1-mile trek through the lovely Chiltern countryside. Hundreds also took on the Fun Run, incorporating the coveted Schools Challenge, which involves a £250 prize each to the school with the four fastest boys and girls covering the distance. Running is the most basic form of physical activity we can do, and it has been embraced by millions across the country in recent years, thanks in part to the phenomenon of parkrun, the series of free 5k runs organised in parks across the UK. The full-distance marathon is seen by many as the ‘pinnacle’ of running success, but the half-marathon is an equally worthy – and more attainable – goal, given the right approach and a good dose of determination and family support. To prove that anyone can do it, we have taken a group of runners from a local running club and challenged them to complete the Berko Half Marathon. Two of them are new runners taking on the distance for the first time, four are experienced runners looking to take a sizeable chunk off their personal bests (PBs) for the distance, and two are at the top end, looking for a top-10 finish at the end of the day. 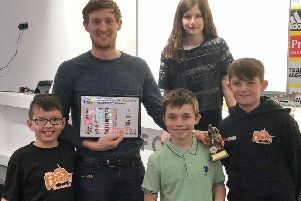 All of them will be coached towards their goals by Rob Deane, a Potten End-based UK Athletics coach and an accomplished runner himself, with a number of marathons, triathlons and other distances under his belt. Rob will be guiding them towards their targets, chivvying them on when training seems like a chore, reining them in when they’re at risk of doing too much and providing that much-needed shoulder when it all seems too much or when the nerves kick in. So let’s meet our group! We’ll be checking in with them every week to see first-hand how their training is going and how they feel as race day draws near – and we’ll see how eight very normal people from our local community take on a challenge that is anything but normal. We hope you feel inspired and will join in! Alexis Bunce, 43, stopped smoking in early 2012, joined Slimming World and started a ‘couch to 5k’ course, losing three stone in the process, and now runs regularly with local running club Dacorum & Tring. Jim Mason, 37, is also a first timer, and a fairly new runner – he’s only been running seriously for a year, having lost some 11 stone since he decided to get fit 18 months ago. Richard Brawn, 33, is hoping for a sub-1.30 finish, saying: “I’m excited about the race as I’ve not done a half marathon since this very event two years ago. Rob Salt, 52, will run the half marathon distance for only the second time, after completing the St Albans ‘mini-marathon’ as it was then called, in 1983 in a quick 1.24. “My target for Berkhamsted is 1.45, but I’ll settle for anything less than 2 hours,” he said. Samantha Sullivan, 42, has a PB of just over 1.45 for the distance, achieved on a mostly flat course in Bournemouth last autumn, and her target is to get under 1.45. Kelly Du Buisson, 31, finished eighth in Berkhamsted last year, and is looking for a 1.31 finish in 2016, which, she says, “is going to be a push as I need to knock 40 secs off my previous time. Jamie Marlow, 35, finished sixth overall in last year’s Berko Half in a time of 1.20.07, and he’s hoping to better that in 2016. “I’m looking for a good run because it’s the main local race,” he said. “I have many friends running and to keep my self-confidence going to the Reading Half, I’m looking to go sub-1.18. Niamh Demspey, 32: “I have been running for 13 years and my last half marathon was the Berko Half four years ago. Since then I have moved from Northampton to Berkhamsted and I’m looking forward to revisiting the challenge. Coach Rob says: “The runners come with a wide range of abilities and from varied running backgrounds, and all have differing motivations for wanting to take part. “This means that, while their training plans will share the same basic principles in building the stamina, strength and speed necessary for them to meet their goals, they also all have differing strengths and weaknesses so no two plans are the same. Next week: Niamh and Richard look back on their first test, an early season marker in the 10-mile Fred Hughes race in St Albans, and Coach Rob weighs in with words of wisdom - and caution.